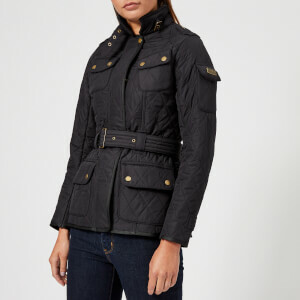 Women’s ‘Polarquilt’ navy jacket from the heritage British brand Barbour International's Tourer collection. 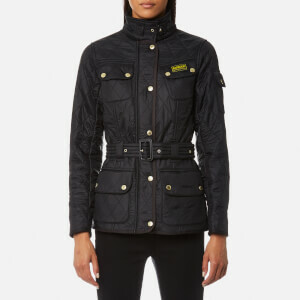 Crafted from technical fabric, the classic biker jacket features an all over diamond-quilted pattern and a warm Polarfleece lining. 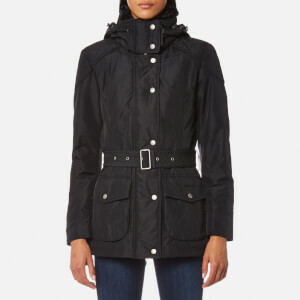 Fastened with a two-way zip and a snap button storm flap, the jacket is detailed with four studded pockets, a fleece-lined funnel collar with a belt strap. 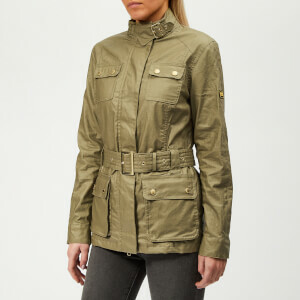 Complete with an adjustable belt around the waist and the signature Barbour International logo to the chest pocket.